PARSIPPANY, N.J. (April 4, 2019) – Wyndham Hotels & Resorts (NYSE: WH) has been recognized for its culture of inclusion by the Human Rights Campaign on the heels of reinforcing its commitment to workplace fairness for lesbian, gay, bisexual, transgender and queer (LGBTQ) team members. Within the same week of joining the Business Coalition for the Equality Act, Wyndham Hotels & Resorts earned a perfect score of 100 as a Best Place to Work for LGBTQ Equality. On March 26, at the Diversity and Inclusion Conference in Philadelphia, Wyndham Hotels & Resorts joined the Business Coalition for the Equality Act, a group of leading U.S. employers that support the Equality Act, federal legislation that would provide the same basic protections to LGBTQ people as are provided to other protected groups under federal law. In joining the Business Coalition for the Equality Act, Wyndham Hotels & Resorts reinforced its strong history of diverse and inclusive practices, with full leadership support, to its team members, partners and customers. 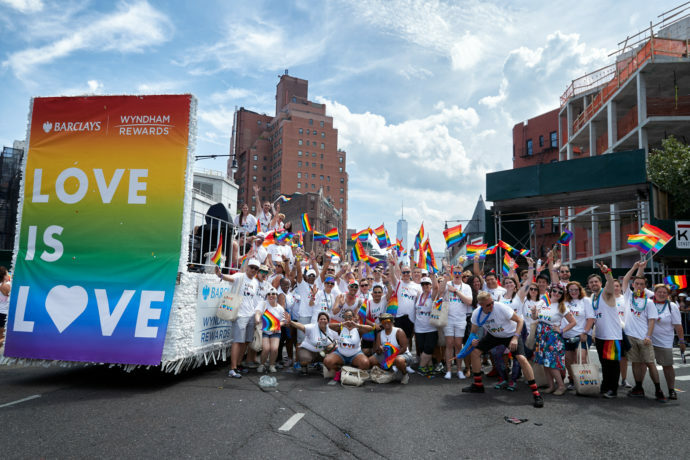 As part of Wyndham Worldwide, the Human Rights Campaign named the Company as one of the Best Places to Work for LGBTQ Equality nine times with a perfect score of 100. Recognizing that embracing inclusivity is good business, Wyndham Hotels & Resorts appeals to diverse consumers, cultivating welcoming environments in its hotels, in addition to supporting its team members. An important element of this culture is Pride, an affinity business group dedicated to fostering a culture of acceptance and equality within the Company. With local chapters in several corporate locations, Pride members raise awareness of LGBTQ issues, lead community support activities, and drive a positive impact on business practices and goals. The 2019 Corporate Equality Index evaluates LGBTQ-related policies and practices including non-discrimination workplace protections, domestic partner benefits, transgender-inclusive health care benefits, competency programs, and public engagement with the LGBTQ community. For more information on the 2019 Corporate Equality Index, or to download a free copy of the report, visit www.hrc.org/cei. Wyndham Hotels & Resorts (NYSE: WH) is the world’s largest hotel franchising company, with approximately 9,200 hotels across more than 80 countries on six continents. Through its network of approximately 810,000 rooms appealing to the everyday traveler, Wyndham commands a leading presence in both the economy and midscale segments of the lodging industry. The Company operates a portfolio of 20 hotel brands, including Super 8®, Days Inn®, Ramada®, Microtel Inn & Suites®, La Quinta®, Wingate®, AmericInn®, Hawthorn Suites®, The Trademark Collection®, and Wyndham®. Wyndham Hotels & Resorts is also a leading provider of hotel management services, with more than 400 properties under management. The Company’s award-winning Wyndham Rewards® loyalty program offers more than 70 million enrolled members the opportunity to redeem points at tens of thousands of hotels, vacation club resorts and vacation rentals globally. For more information, visit www.wyndhamhotels.com.